It doesn't quite feel like Christmas until I've started to bake. In high school, I would bake something pretty much every weekend as a way to relieve stress and even since I've found baking to be therapeutic. All of my friends knew to expect some sort of cake, cookie, or cupcake from me on their birthday in addition to a prize and coming home for the holidays and knowing that all of my favorite cookie sheets, wire racks, and decorating supplies are awaiting me still gets me excited. My family has come to expect some of the treats I make over breaks and the dessert table for Christmas has slowly become my domain. A domain I take very seriously because what's better than treats covered in chocolate and filled with as much love as sticks of butter? With Christmas movies on in the background this year I got to baking and may have made a few too many cookies. Fortunately, Nell came over and helped me decorate so a number of the cookies ventured home with her to be enjoyed by her family. I usually break up my baking and decorating day just because of how long it can take for the base icing to dry but that gives me plenty of time for me to think about how I want to decorate. While I love taking photos of outfits and flat lays for the blog I think in my next life I am bound to be a dessert cookbook photographer because taking and editing these photos is almost as much fun to me as eating the final product. 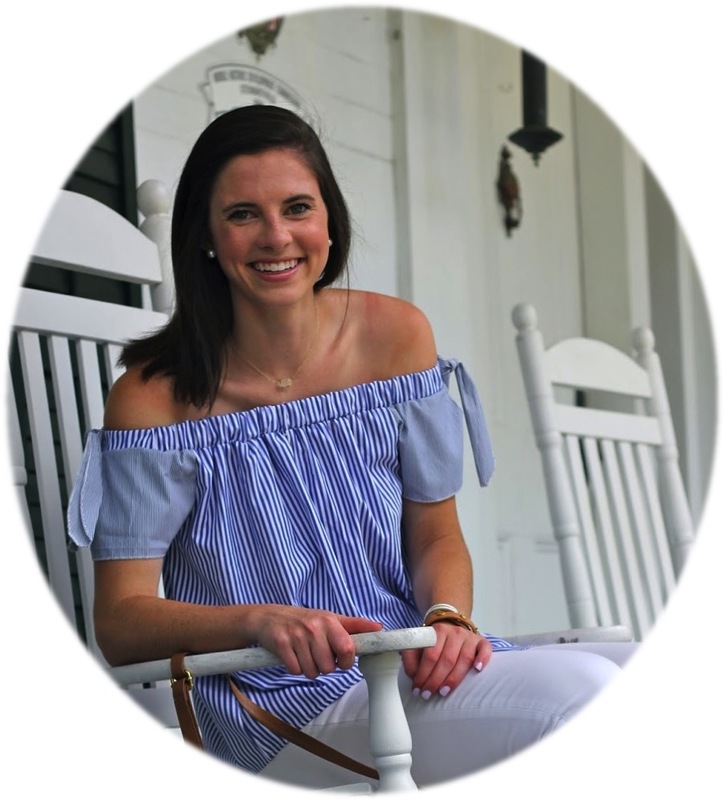 Maybe if I ever find free time there will be a Prep In Your Step cook book but for now hopefully these recipes suffice as you finish up baking before the big day! 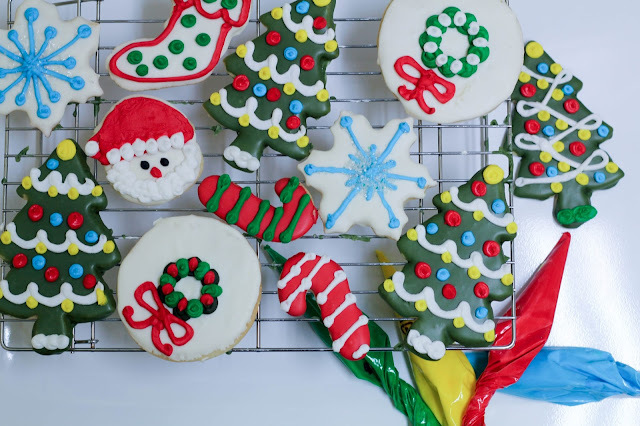 For the sugar cookies I've included the entirely homemade recipe that I use although when I used to host a cookie decorating party I would use the Betty Crocker Sugar Cookie Bag Mix since I needed to make so many and it was similarly delicious and a bit less messy. Depending on how thick you roll out your cookies this can make anywhere from 25-35ish cookies. Preheat your over to 350 degrees Fahrenheit. Bake the cookies for 8-10 minutes or until edges begin to appear golden brown. - Start by creaming the butter and the sugar together. I use my kitchen aid mixer for all of this. - Add eggs slowly and then add vanilla. - Stir dry ingredients together and then slowly add them to wet ingredients in mixer. - Allow dough to form by leaving in the mixer for 30 seconds or until the mixture begins to clump and form a dough. Once the dough is done I like to put it in the fridge to cool for a bit. Usually by the time I have the kitchen cleaned up and all of my cookie pans are covered in parchment paper the dough is good to go. 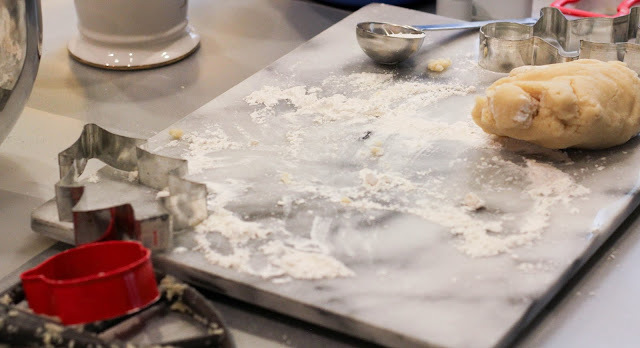 For cut-out cookies I like to use a marble slab and cover it with flower when pressing out dough by hand. I don't really like using a rolling pan because I find it frustrating when the dough sticks to it but if you've perfected that technique then that should work too. -Once you've cut out a cookie put it on a greased cookie sheet leaving it about an inch from the nearest cookie to avoid too much overlap. - After filling a tray put the cookies in the oven for about8 minutes and check to see if edges are golden brown. 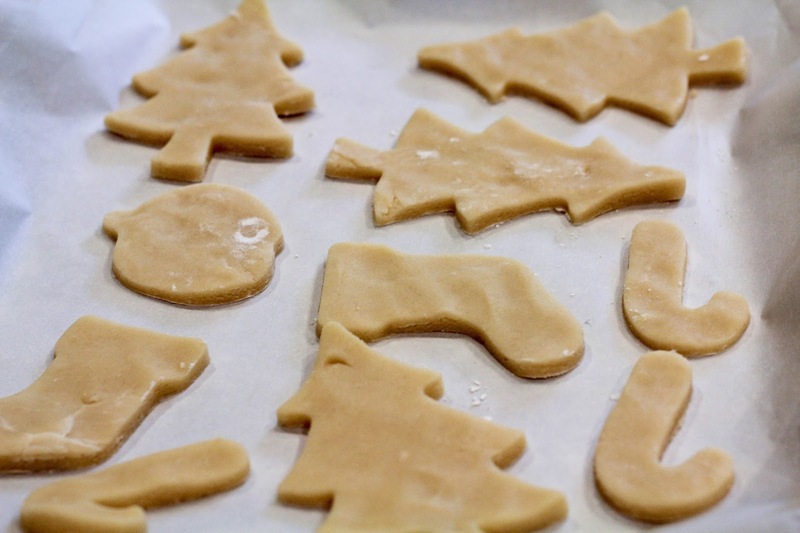 Once they are take the cookies out and allow them to cool on the cookie sheet for 10 minutes to ensure they are firm enough to be picked up..
- Move cookies to wire cooling rack for remainder of cooling. For the base icing I use a royal icing recipe that I found online and have modified. I also use a kitchen aid mixer to mix all of these ingredients. - Take 3 eggs and use just their egg whites. Pour those into the mixer. - Take one box of powdered sugar and slowly add that to the egg whites while mixing. This consistency is usually a bit thicker than I want it to be to coat my cookies so I usually add a splash of milk to thin it just a bit. 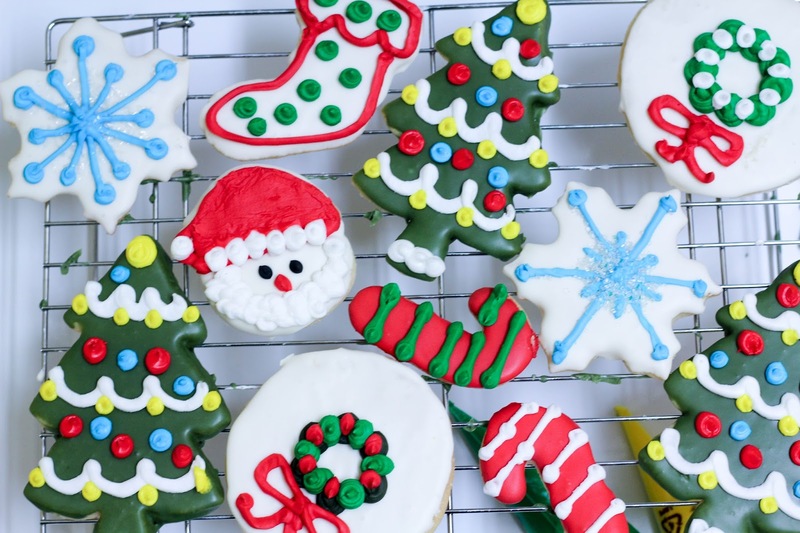 If you are hoping to have a thicker icing or use this recipe for decorative icing you may want to add more powdered sugar. If you want to color this icing I have found that both liquid and gel food coloring work great although if you are adding food coloring you may not need the last splash of milk. 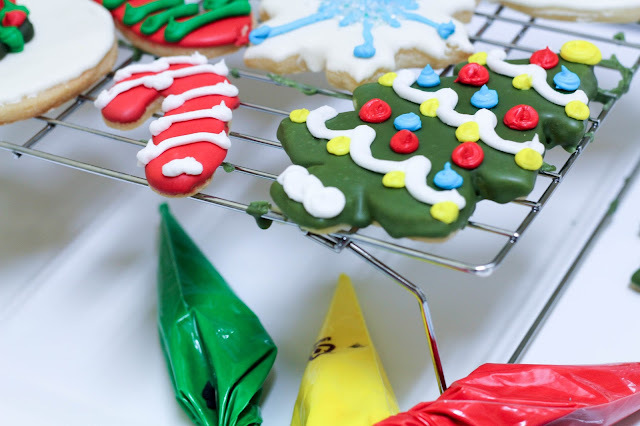 The original color of this icing is a great bright white that serves as an excellent base before decorating. When it comes to actually covering the cookies in this base icing all I do is take a cookie, flip it over, and dip it flat into the icing making sure to cover it completely. Then, once I know it is covered I slowly lift it out of the icing tilting it so that excess icing all "drains" to one side. I use a kitchen knife and scrape off any of that excess to make sure that it is smooth and doesn't have any bubbles. This icing takes a number of hours to dry so typically if I've done the baking and base icing covering in the afternoon I don't put the cookies away until right before I go to bed. For decorating icing I use meringue powder from Wilton. The recipe I use is the one included with the can of meringue powder but I have modified it in order to be a better consistency to flow out of pastry bags. I also use a kitchen aid mixer for this as well. -Take 3 tablespoons of meringue powder and put it in your mixing bowl. - Add 4 cups of powdered sugar. - Start by adding 2 tablespoons of water and begin mixing all ingredients on low. I add at least 4 more tablespoons of water if not 5 depending on how the texture appears. Then I separate the icing out into smaller bowls so that I can use many different colors to decorate with. Although it may not seem like that much icing when you separate it out it tends to be plenty for decorating the cookies and I always end up having leftover icing. Also just to note, I ue pastry bags when decorating but instead of using specific decorating tips I prefer just cutting a small opening in the bag. 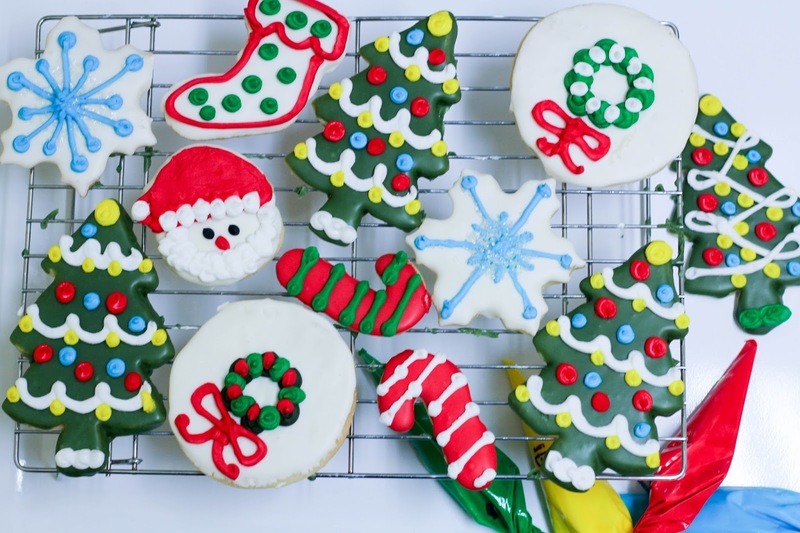 Although the cookies can be time consuming they are so fun to bake and decorate and you will surely receive tons of compliments when taking them to any holiday party you may be attending! If you are in need of a quicker or easier recipe then here is another one for you, Oreo Truffles. These are delicious, addicting, and don't even require you to use the oven. 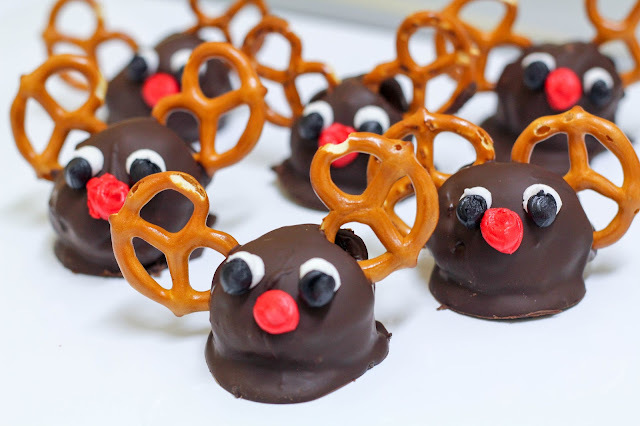 And best of all, these can look equally festive just by adding some pretzels and icing to have them appear as reindeer. - Using a food processor grind the oreos into a fine powder consistency. - Combine ground oreos and cream cheese until mixture is moldable. - Form small balls out of the oreos and then stick them in the freezer for 10 minutes. During this time I typically clean up any mess I've made and then begin to melt the Baker's chocolate. I like to do two packs of this at once instead of all four. It melts easier if you go ahead and break it into small squares. - Microwave the chocolate in 30 second incriminates and stir each time after the timer goes off. - Roll oreo truffles into melted chocolate and place on wax paper. - Before the chocolate hardens place two pretzels on either side to look like antlers. 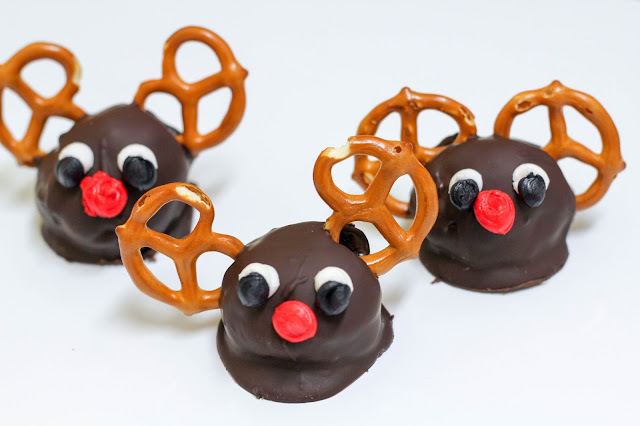 - Once the chocolate is completely dry put one dot of red icing in the center (I used royal icing from the recipe above) and add eyes (could be icing or small candies). Happy Christmas Eve Eve! I hope that y'all are feeling prepped and ready for the big day. We are headed to my grandparents house this afternoon which is where we celebrate Christmas each year so the presents are in the car as are all the sweets and other food we've made. We will be heading back home on Monday (my birthday) and I should be back on schedule with blog posts since I *finally* have my computer back after a week of dealing with it getting fixed. Glad that's over! If you decide to try out either of this recipes I'd love to know what you think! Wow, your icing techniques are amazing! My cookies would turn out so ugly! 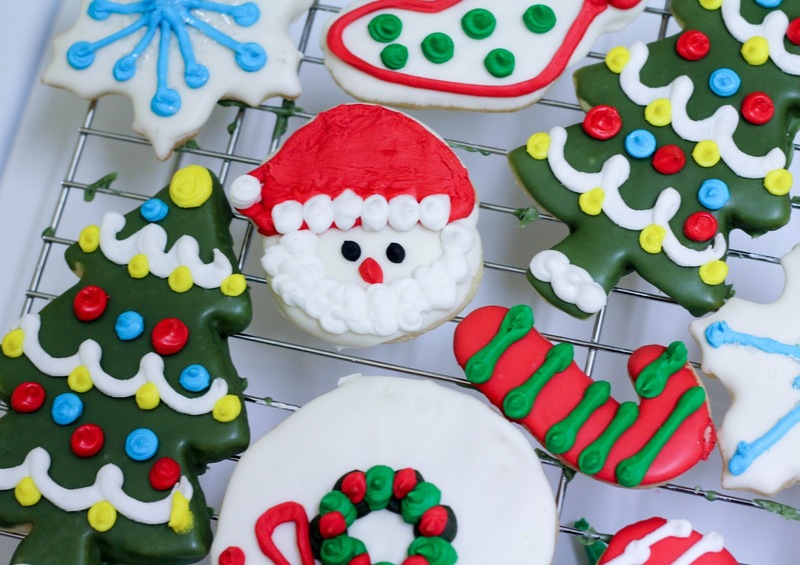 Those cookies look amazing! I am going to have to bake some homemade Christmas cookies now! 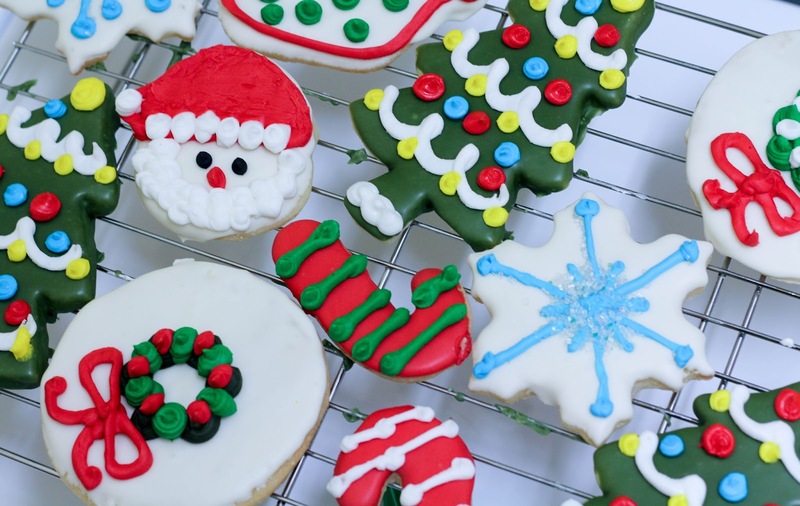 Wow, you really could go into a career as a dessert decorator/photographer - those cookies look wonderful! Have a merry Christmas! Jewelry is a new series by GEMOLOGUE, featuring my latest discoveries from the world’s most exciting Swimwear designers and their spectacular creations – stunning Hermes handbags you will want to add to your own personal Brazilian Hair collection.